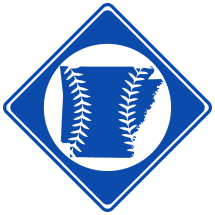 The First Baseball Game in Arkansas was recorded by the Arkansas Gazette on May 14th, 1867. The newspaper piece described a game between the Pulaski Base Ball Club and the Galaxy Base Ball Club played on May 11th, the first of its kind recorded in Arkansas. The Pulaski was duly declared the winning club, by Mr. E. P. Bishop, the umpire selected for the occasion.' The Pulaski then gave three rousing cheers for the Galaxy, and for the umpire who had so fairly and impartially given his decisions, which were immediately acknowledged and returned by the Galaxy. The utmost harmony and good feeling prevailed, and the evening was one to be remembered by all the lovers of this manly and interesting game. The Galaxy played well, considering the youthfulness and inexperience of its members, and its very recent organization. We advise them not to be discouraged, by failure in this their first attempt, but to adopt the old adage 'try, try again.'" It's not certain that this game was indeed the first baseball game played in Arkansas. It was merely the first recorded. Contrary to some sources, Albert Pike did not play in this game.